As the hours go by unremarked, Italian food artist Diego Cusano assembles yet another masterpiece–this time applying ink around a ripe, yellow half-avocado to resemble a human eye. Although the majority of his pieces are edible, he also uses other common, every day objects such as electric razors and handheld tools to bring new life and a touch of refinement to ordinary, overlooked objects. “The difference between myself and the other illustrators is that I publish new works daily, whether it’s writing a diary page expressing my opinions, describing an event, an art piece or simply my emotions at the time,” he says. Everybody needs food to survive. It’s something we all consume daily. So why not focus on something we already relate to? Plus, it’s easy to shape and change as you wish. Famous artists of the past, like Caravaggio, used food for their artwork, so I’m just carrying on tradition. Not to mention that food is very fun to prepare. I like cooking for friends and I use my creativity when preparing my dishes by not only inserting some unexpected ingredient in the recipes, but also by presenting dishes in a creative way. I always choose common foods in order to find a common starting point, then I flip things a little. A funny thing about me is that I only use what I like to eat–and you can see that sweets are predominant in my gallery. 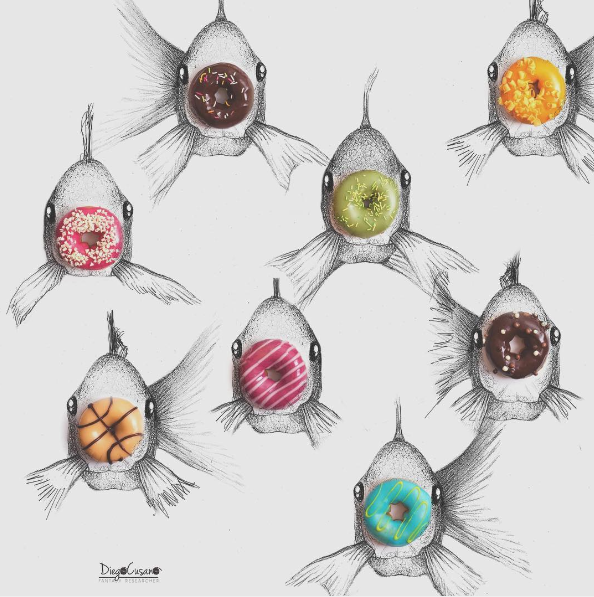 Most of the donuts and biscuits shown in the drawings have been eaten a few minutes after use. My ideas are always sudden. When something sparks, I often write down the concept and draw them as sketches in my Moleskine. I typically start with the object first. I watch it, I position it on a white sheet, I search and select the right position and once that’s done, I start drawing around it using a pencil and a thin pen for defining particulars. Sometimes I use different art techniques, like watercolors or ink as well. Although I have an unwritten set of rules that I typically follow, the project may change direction without notice, the reason being inspiration cannot be created nor controlled. It comes in the most unexpected moments. I could be inspired from taking a trip, reading a book, viewing a landscape, or simply eating. I tend to focus, observe, decontextualize, then change my point of view. Colors are also very important to me in terms of creating emotions. I graduated with honors from a Fine Arts Academy. I think that education is necessary to learn technique, but the most important things are the personal sensibility and talent, the things that cannot be taught. Modern and contemporary art are my favorites. I’ll always pay visits to galleries and museums whenever there’s one around. It’s a good way for me to see famous artworks face-to-face and discover the new techniques. The majority of the time, I’ll learn secrets from other artists just by observing their work close-up. To become what I am today I had to fight against everything and everybody that stood in my way. The most important advice I can give is to set goals and work your hardest each day to achieve them without caring about people’s judgement. It’s important to live each day as if it were the last and you can’t spend the necessary time on your craft if you worry about others. Honestly, it’s difficult to pinpoint. Sounds cliché, but I achieve daily satisfaction through my followers on social media. They always show me love and I show it back. In Italy, my main exposure came last February when I participated on a TV show to display my work. There’s about 200 articles floating around as well, between online blogs and newspapers covering me. Amy Winehouse, Prince, and David Bowie all intrigue me. I grew up listening to David Bowie for his personal approach and style. Amy Winehouse accompanied me during a particular tough period during my life. She was a simple, yet highly talented, person able to impose her look and her music to the public, which is what I hope to do with my art as well. I decided to create pieces based on each of them because I wanted to pay homage to the impact they’ve had on not only me, but on many other creatives as well. Everything started when I realized that reality around me was attempting to influence my life and my living rhythm. I looked at it as a challenge, though, and started changing reality using common objects under a different use – skewing the point of view. My ultimate goal is to demonstrate that we still have the possibility to handle reality instead of getting handled by it.